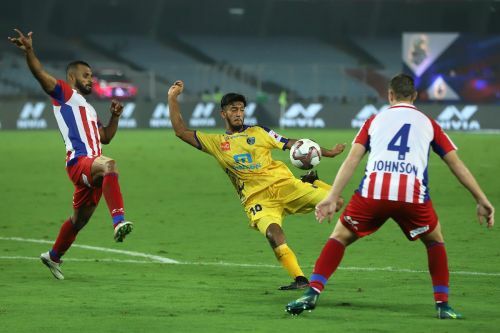 Two powerhouses of Indian football face each other as FC Goa go up against Kerala Blasters at the Jawaharlal Nehru Stadium of Goa, on Monday. FC Goa has been a team gaining momentum with each passing game. The side is unbeaten in their last 5 games and is on a positive run with victories against NorthEast United and Mumbai City. The attack has been supported by an equally exceptional defensive lineup that has kept 4 clean sheets in these games. With 3 matches including left, FC Goa might pose a challenge to Bengaluru FC's position at the top of the table, which looked out of their reach at a time. The Gaurs are second on the ISL points table with 28 points from 15 games. Kerala Blasters are coming to Goa with the confidence from their first home victory of the season. Unlike the first phases of the league, Blasters have improved in every game since the January break, drawing with Bengaluru FC and ATK. With only two games left, the club might not have much to achieve this season but would be playing for their pride. Currently, Kerala Blasters are 8th on the table with 14 points from 16 matches. FC Goa do not have any players serving suspensions or injured. Kerala Blasters have a full squad available for selection as well. There wouldn't be any doubt about who FC Goa's key player is going to be- Ferran Coro. The striker has been getting everything right this season from scoring goals to providing assists. The Spaniard already has 13 goals and 6 assists this season and would certainly be the biggest challenge to the Blasters defence. With 3 goals from the last 3 games, Coro will feel like he can find the back of the net with ease. Sahal Abdul Samad will be a key presence in the Blasters lineup against Goa. Though Matej Poplatnik too has been doing well with goals, Sahal would be the counter to Edu Bedia in the Goan midfield. The Kerala midfielder scored against Chennaiyin FC and has been pulling out attention-grabbing performances, which would be vital against the Gaurs. A win against Kerala Blasters will make FC Goa qualify for the playoffs and it wouldn't be surprising from Sergio Lobera to frame the game according to the need. Back-to-back attacks would be what the hosts plan against the Tuskers but if the visitors can stifle the hosts in midfield, they might have the last word.